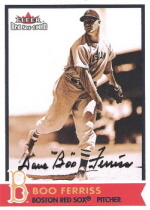 If there was an autograph Hall of Fame, Dave “Boo” Ferriss would be enshrined. When he died on Thanksgiving at age 94, collectors lost a friend. The former Red Sox pitcher signed 227 out of 228 recorded requests, says www.sportscollectors.net. I’m astounded at how many hobbyists received notes, photos or other bonuses with their requests. “Boo” shared this with me in 2010. Enjoy! Autograph collectors: can you do more in 2017? Off topic, Down to 130 autograph 1952 topps cards for a set. Do you have any cards, or interesting memories on 1952 topps requests?